A few months ago, Nicole of Designs by Lulubelle had a fantastic idea to decorate walls using fabric and embroidery hoops. So clever! 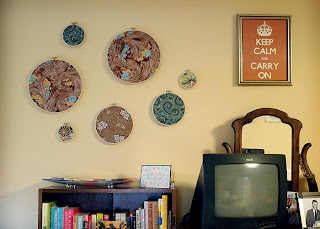 I had an area on a wall that needed some TLC so I picked up a few embroidery hoops (1.39 ea at AC Moore! ), gathered some fabric scraps that I already had, and heated up the glue gun. I like how it has started but I think I might switch out some of them for brighter colors, as well as add some more pieces. It was fun and easy to do! Wow, that looks really cool. I think I'll steal the idea for my studio walls! Oh I did one of my walls a few weeks ago I'll have to post mine. Allison it came out great! I love the sign to the right.